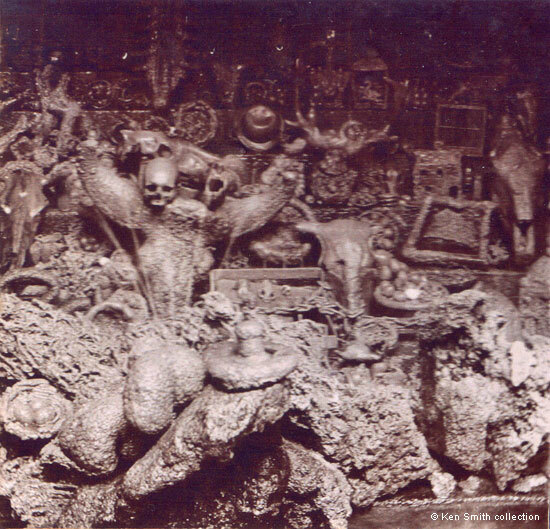 As well as the usual array of small objects, such as birds' nests, eggs, fruit, vases, and hats, this stereoview indicates that some slightly unexpected things were also popular souvenirs for nineteenth century visitors to the petrifying wells of Matlock Bath. The enlargement below shows that amongst the numerous items in the display were antlers and a cow's head, as well as one of a horse and another that was possibly a donkey, all undergoing petrifaction. There also seem to be two small skulls, one of a monkey and one that may or may not have been a very small human. It is difficult to know. There is also a chain. As the process took up to a year to complete, and sometimes longer, some people sent whatever they wanted to be turned into stone to the petrifactioners rather than delivering the item in person. An 1870s advertisement placed by Jacob Raynes, a Lessee, stated that "The only ROYAL PETRIFYING WELL is on the High road leading to Cromford, and is the second well, known as "Jacob's Well". It was from this well that her most Gracious Majesty when a girl chose a bird's nest". Mr. Raynes' terms were "Reasonable" and he welcomed both excursionists and school parties. Matlock Bath was visited by thousands of excursionists at holiday times in the mid to late nineteenth century and its regular season visitors were also numerous. Touting became a real problem and the more discerning visitors were starting to make unfavourable comments in both the press and guide books. Cavern guides, cab drivers and petrifactioners all tried to out-shout each other in an effort to entice visitors to their particular attraction or mode of transport. Matlock Bath's Local Board expressed grave concern about what was going on in 1892. The Board had thought that the issue had gone away but found that leaflets were starting to replace the shouting, thus creating a litter problem. They were determined to deal with things as best they could. "Mr Buxton remarked that the greatest annoyance was from the petrifying wells, where they were calling out a thousand times a day. At the well near his house and on the other side of his premises the shouting was awful. There was a regular obstruction and people were touting every day". It must have been extremely unpleasant to live next door to. Gem of the Peak (1840) - read the section on "What to do in 1840" as there is more information about petrifying wells (scroll down). Stereoview from the collection of and © Ken Smith. Information written, researched by and © Ann Andrews. Raynes' advertisement appeared in many issues of the "Derbyshire Times", although this quote was from the edition of 3 August 1872. Raynes meant Queen Victoria. "Derbyshire Times", 15 Jul 1882. A few years later, in 1908, J. B. Firth, was extremely frank about how unpleasant things had become in his book "Highways and Byways in Derbyshire", MacMillan & Co., London. "Derbyshire Times", 18 June 1892. Mr. Herbert Buxton owned both a Museum and the Switchback Railway.